We've finalized the details for the next evolution of the poker run. It's called the camp n' cruise. We will start the event on Fri night May 29th at Two Wheels in Suches. It's a motorcycle only location situated in the north east ga mountains but they've opened their doors to us for the weekend. Saturday morningish we'll head out on a cruise in the north GA mountains returning back to the campsite that night for a nice cook out. More details to follow but go ahead and start planning to be there now. 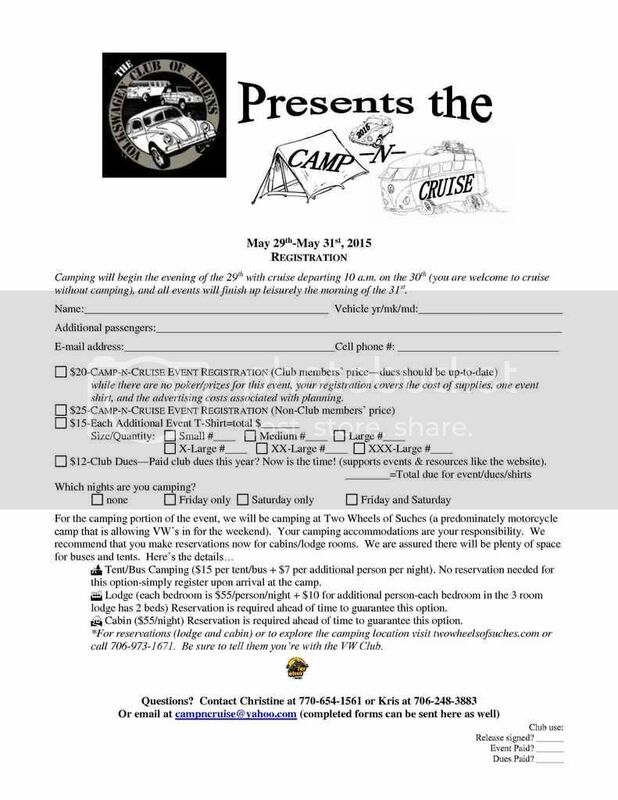 Cabins are available for those not wishing to bus/tent camp. 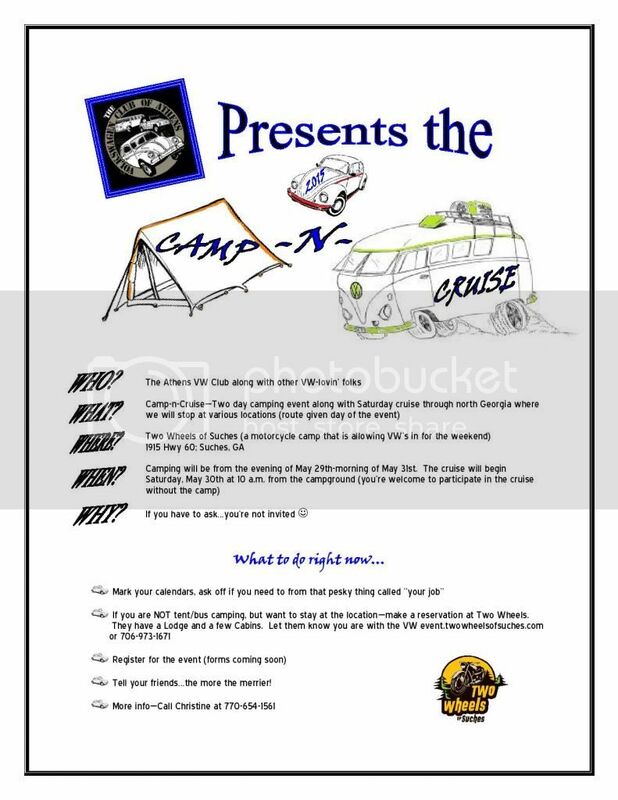 Posted: Thu Feb 19, 2015 8:27 pm Post subject: Is there a group setup for camping? I was curious what the setup for the group camping will be. They have a nice flat open field adjacent to the lodge that we'll be camping in. We'll make a big circle with the buses and tents with a fire pit in the middle. Get your reservations in early, I've heard indoor accommodations are filling up! We have the registration form ready. Please fill it out and send it in to make sure you have a spot! Here is a downloadable version of the form. When you click on the link, a page will pop up asking you to sign into drop box. Don't do this (unless you want to) Wait a minute and the file will appear. Can you post a map of the route we will be running? It will help me on which bug I need to get ready. I'll see what I can pull together. I'm looking forward to this drive. I changed the wheels and tires on the Thing and got rid of the horrible vibration I was getting at 60 mph. I ordered new rear shocks too. I'm so ready to have the Thing in the mountains again. 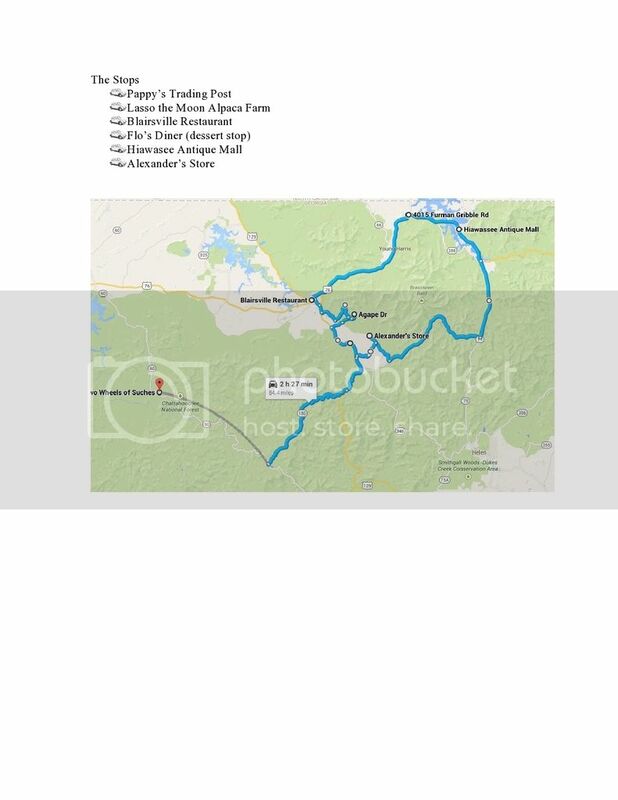 here's the route info etc, there won't be any electrical hookups at the camp site so bring a lantern/flash light etc. Sorry to hear that Pat, maybe next year. For everyone who is going, please get your payment in, We aren't ordering any extra shirts this year. Other then filling in the form and emailing to ya'll, I do not see how to send in my payment before the event. Please help me understand how to make full payment to VW Club of Athens.